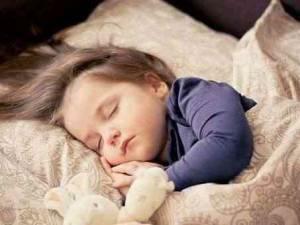 Home » Motherhood + Parenting Tips » Infant + Toddler » When Will my Baby Sleep Through the Night? 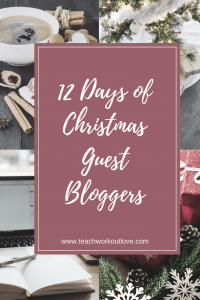 Every day for the countdown until Christmas I will be having guest bloggers visit my page and share some tips they have learned along the way in their motherhood journey. Be on the look out for our Guest Bloggers Series! The answer to this question may surprise you! When parents ask me this, I know what they’re looking for is a quick answer that probably includes a precise timeline. “2 nights from now” or “when your baby is this exact age”​ ​are the kind of responses I wish I could give them and I’m sure are the answers they want. But, sleep is complicated, and there are many factors you have to consider before you can answer this question at all. Your baby will never sleep through the night! That’s right! There, I said it! 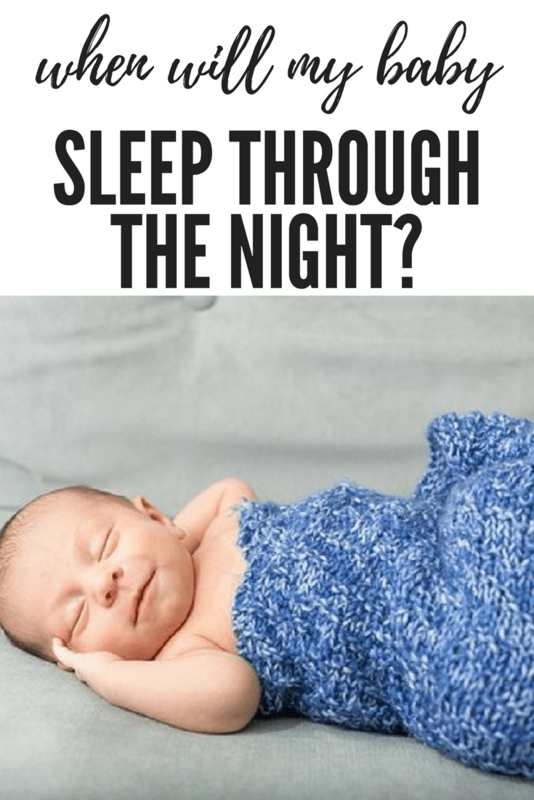 A baby that will NEVER sleep through the night might make some of you decide you’re going to toss in the towel and give your baby up for adoption but stick with me. Not only will they never sleep through the night now, but they also won’t sleep through the night when they’re toddlers, teenagers or grown-ups because nobody ever does. Human beings sleep in cycles, which vary from light sleep to deep sleep, and round and round we go all night long. Do you ever remember something vaguely from the night? A dog barking, a telephone ringing or adjusting yourself in your bed? These little things are often us between a sleep cycle and sometimes enough to wake us up. As adults, we have experienced this so many times, and we don’t notice much and go back to sleep. Often, the wake-up is so brief that we don’t even remember it the next day. It’s very different for babies who are used to something external “helping” them to sleep such as being rocked, sung, bounced or nursed to sleep. This type of baby will require external help to get back to sleep peacefully in the night. I think the question that parents should really be asking is, “when will my baby fall asleep on their own and sleep ALL night long without waking me up?”. Well, that’s a much easier question for a sleep consultant to answer! A great place to start would be with my 7 Best Sleep Tips For Sleeping Through The Night. This is a totally free resource and the foundation of what I teach my clients. Quite simply, your baby will fall asleep quickly at bedtime and sleep all night long without waking you when you teach them how. Teaching a baby this skill is one that they’ll use every night, all night long, for the rest of their lives. Talk about a gift that keeps on giving! There’s a lot more to teaching your baby this skill than the traditional Cry-It-Out approach where you leave your baby alone in their crib to figure it out. Although this approach has worked for many people, it’s not one I find most people to be comfortable using. It’s also not the most gentle or effective way of teaching your baby great sleep skills. I think the traditional Cry-It-Out approach is a lot like leaving your child in front of a guitar with some sheet music and saying, “Figure it out.” They might figure it out, and you could even have the Jimi Hendrix of sleep on your hands. But, assuming your child is like most, they could probably benefit from some lessons. With any new skill, we learn we know that practice is important. So, let them try to fall asleep independently and put themselves back to sleep in the night. There’s probably going to be a bit of protest, but that doesn’t mean you can’t go in and support, encourage and reassure them. I would discourage you from playing the guitar for them! That’s not going to teach them much. Whatever it is that you’ve done to “help” your baby to sleep at bedtime or in the middle of the night are “sleep props” that are the equivalent of playing the guitar for them. They’re going to be frustrated. Change is hard, and it’s also challenging to learn a new skill. I can’t give you an exact date or age when your baby will sleep through the night all night long without waking you. But I can tell you with absolute certainty that it will happen much, much sooner if you stop doing it for them. 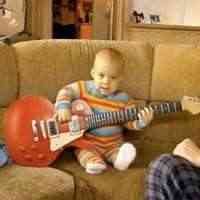 As for if your little one will play guitar like Jimi Hendrix, one can hope! 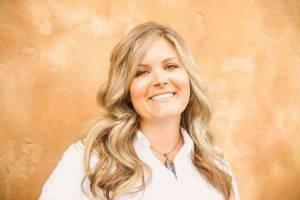 Have questions about your little one’s sleep? Connect with me on Facebook and post your questions. I’d love to help. 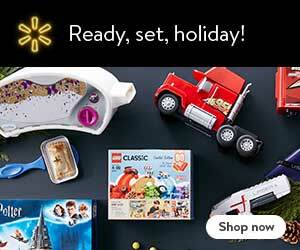 3 Ways to Help Mom Keep it Together through the Holidays! Totally agreed. 6 hours straight is pretty good for a little baby ! Agreed – definitely not fun! ?